The McRib’s Ribs . . . Aren’t. Nu? I was raised to be intimately familiar with lunch meat. All kinds of lunch meat. And sausage. 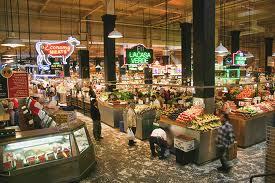 My father worked in the Grand Central Market from my birth until my Bar Mitzvah. Faber’s Ham Shop. They didn’t sell fresh meat, except chicken. Everybody sold fresh chicken because it was small and easily cut into its constituent parts, a feat not possible with a cow or a pig. He mostly sold lunch meat, or what is sometimes referred to as smoked meats. Not all of it was, but that’s of little importance to this story. I can still recall the scene after my Bar Mitzvah – I mean immediately after; probably in a private room during the reception (it was at a place in North Hollywood, CA, USA that has gone the way of the Dodo bird) – where I endorsed every check I had received as a gift from my family and our friends. I immediately handed the checks over to my father, who was leaving Faber’s Ham Shop and striking out on his own. He was buying a truck and becoming a peddler. A meat peddler. It was an amicable resignation, as Louie Faber became one of my old man’s best customers and the Grand Central Market was always pretty central to my father’s success. I bring this up merely to demonstrate my familiarity with — perhaps a modicum of expertise in the field of — lunch meat in all it’s numerous incarnations (Oops!) and variety. I have eaten just about every one of those varieties. I didn’t necessarily care for them once I tasted them, however. Head Cheese and Olive & Pimento Loaf come to mind, but I tried them. Some of the varieties I was quite fond of, especially since they were already cooked and I could grab one whenever I was hungry. This was especially true of hot dogs and FARMER JOHN® Hot Louisiana Brand Smoked Sausage, the former of which we sold in very large quantities loosely packed in boxes of about 50lbs. ; the latter of which came in cases of 10 5lb. boxes. It was easy to open a case, pick up a box, open it, and remove (and eat) one of the hot links. This brings me to the graphic that appeared on my Facebook News Feed yesterday; a graphic which tickled me to no end. As I have said, what we today view primarily as culinary crap; unhealthy, sometimes disgusting pseudo-food, was a long-time staple of mine. Frankly, I still eat hot dogs, though I now only purchase all-beef (usually from Trader Joe’s) and I deeply appreciate the occasional Nathan’s natural casing weiner <snap!>. 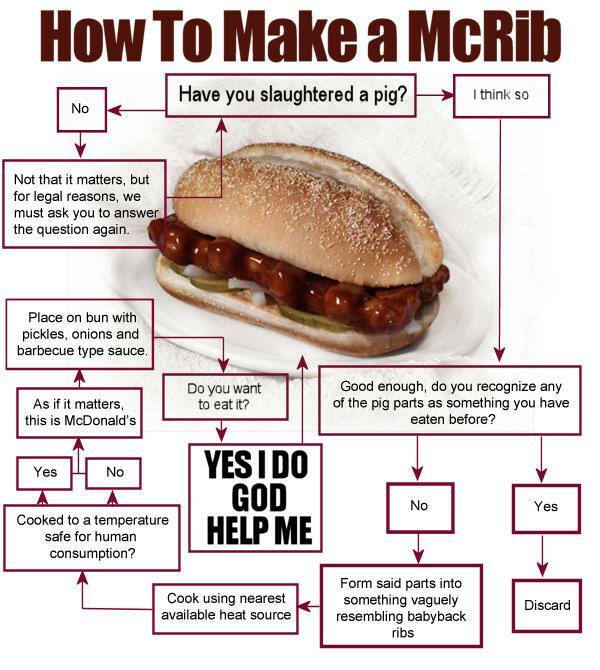 This graphic makes it quite clear the author subscribes to the assertion the McRib is constructed of mystery meat. I’m not sure I agree with the assessment (Wikipedia reports the faux ribs are actually formed from pork shoulder meat), but I now avoid this sandwich like the plague . . . as I do everything by most all fast food outlets (franchise or not). Nevertheless, I can empathize with the sentiment expressed in the last box of this flow chart. I wouldn’t hesitate for a New York minute to scarf one of these babies, i.e. if the only objection was that they’re not really made out of rib meat. I can get by that without batting a eyelash. Unfortunately, there are other reasons involving my health I now refuse to eat this stuff. Doesn’t mean I don’t miss the hell out of it.